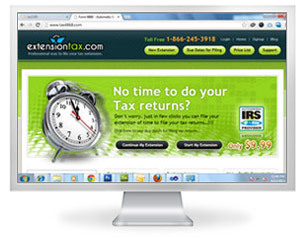 Extensiontax.com is prominent tax efile software certified and authorized by IRS as their e-file partner. Our tax efile software enables efficient filing of tax extension supported by Rich expertise of industry leaders and Tax & e-filing. ExtensionTax.com is a product of Think Trade Inc which is an e-filing industry leader since 3 years. Our electronic tax filing facilities are User-friendly, and simple to use. Form 7004 is used for Automatic Extension of Time to file Certain Business Income Tax, Information and Other Returns. Tax7004.com is leading e-file tax preparation software for federal tax form 7004. Federal tax preparation for form 7004 is made easy by means of our efficient tax return services. Our tax return software offers tax preparation advice and tax preparation help by means of online tax advice from tax professionals. e file tax return with our tax return software to enjoy maximum benefits. Our tax experts provide federal tax help for federal tax form 7004 in a highly efficient manner. Form 4868 is used for Application for Extension of Time to File an Exempt Organization Return. Tax8868.com is efficient tax preparation software for e-file tax preparation of federal tax form 8868. Online tax preparation for form 8868 has been made very simple and quick by our tax return preparation services. Our tax planning services provides tax advice and tax help with features like tax calculator. Our tax software professionals provide relentless customer support by online tax preparation live chat facility. Federal tax return and tax return refund are made really fast with our tax software. IRS electronic tax filing is a cake walk with our efficient tax services. Form 4868 is used for Application for Automatic Extension of Time to File U.S. Individual Income Tax Return. Tax4868.com is an online portal authorized by IRS for e-filing provision of form 4868. There are a lot of value-additions and benefits to Tax4868.com users. Federal Tax Form 4868 is a requisition for an automatic extension of time to file a U.S. individual income tax return.